Posted on 02/07/2013. By Pete Otaqui. The only thing I think it lacks is a really straightforward quickstart guide for new users, hence this blog post. Yeoman may not work or have more trouble running in Windows. Get yourself a Linux Virtual Machine, at once, and do all the following steps inside there. You will need to install NodeJS in a manner suitable for your platform. This should (hopefully) come with NPM as well, or if you not you will also need to install that. Note that the yeoman package is called “yo” and the grunt package is called “grunt-cli”. 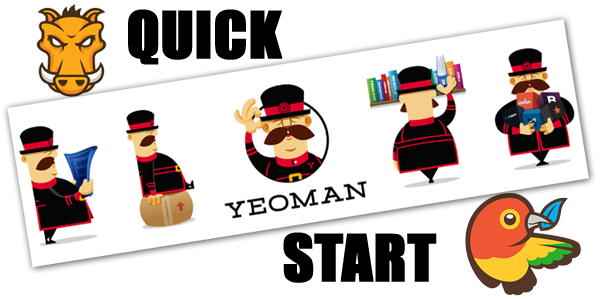 Yeoman uses “generators” to actually create project setups. The “standard” one is called “generator-webapp” but there are many others you may want to look at. Note that throughout 2013, yeoman underwent significant changes, so if a generator package hasn’t been updated since March or April of 2013, you may want to avoid it. You can always install another generator, for example for Backbone or AngularJS, if you want to start a project with those frameworks. Create your project directory, and then run the generator to create all the files and folders you need to get started. In this case I’ve used the standard webapp-generator, which is invoked with the name “webapp”. Lots of the generators will ask you some questions about exactly what features you want or need. You can always tweak this stuff later, but it’s worth getting it right if you can, this is all about making things quick and easy! That’s it. You should see lots of stuff is created in the directory, and your project is set up and ready to go. But what does that mean? From here on in, you will be using grunt (mostly) and bower (occasionally). You can use bower to install any new dependencies you might want, for example “howler” if you want to use that for web audio. There are more grunt commands built in. To get an idea, you can refer to the Gruntfile.js that your generator created for you, and obviously the Grunt.js documentation.